Dundee's V&A Museum has welcomed its 100,000 visitor, three weeks after opening to the public. Sheila Harkness from Monifieth visited the museum on Monday with her daughter Sharron McAllister and grandchildren James and Kirsty. The £80m museum at Dundee Waterfront aims to welcome about 500,000 visitors in its opening year. 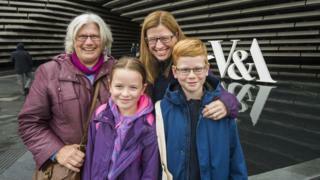 V&A Dundee director Philip Long said he was "proud and delighted" at the initial visitor numbers. He said: "The feedback we have received from visitors has been fantastic and means so much to all of the team here at V&A Dundee. "It's been a joy to see people enjoying the galleries, exhibitions and learning activities as well as exploring the wonderful building designed by our architect Kengo Kuma and enjoying all it offers."